I used to have an olloclip lens for my phone (see these old posts), but now I have a new phone (an iPhoneSE) I bought a much cheaper 3-in-1 clip-on lens set. I mainly bought it for the macrolens, which in this case magnifies 20x. This is actually a bit too much, as you have to almost press the lens on top of the subject and the depth of field is very minimal. The image size corresponds to 9 x 9 mm. I went rock pooling twice in Flushing and it was a lot of fun playing around with it. The photo above is a detail of the Flat topshell Gibbula umbilicalis, which I found quite revealing: the surface is very weathered and the stripes are not that regular anymore viewed up close. Below the first whorls of the same shell, a small Painted topshell Calliostoma zizyphinum, a chiton (believe Lepidochitona cinerea as the shell plates are granular, but it is not possible to make out the girdle due to the depth of field issues) and a tiny Littorina saxatilis (probably, there are similar-looking species). Next, the invasive but very pretty bryozoan Watersipora subtorqata. Common in marinas and on boats but also under rocks on this site. Some colonies are red, others black with a red rim. Finally, some barnacles (I have not given these much attention so far, which is a shame, as they are very interesting animals (and were an important inspiration source for Darwin). The first are very small Verruca stroemia, then Semibalanus balanoides (I believe; I need to check aphotomarine and the excellent flickr accounts by Ian Smith some more). Next, a tiny brittlestar and finally the funny face of a limpet Patella vulgata. I will be switching from snorkelling to rockpooling in the winter months and thus will use it a lot more. Most lichens are perfect for this little lens as they tend to be flat and have beautiful colours and textures so I will post about these soon. I have not been tempted to go back snorkeling yet, but had an hour of nice rockpooling last Saturday, at beautiful Carne Beach on the Roseland Peninsula. I had been here only once before, and found my first stalked jellyfish then. The stalked jellies (Haliclystus octoradiatus) where still there, in different colours: brown, yellow and grey (I will keep to my resolution to record my findings from now on, when I find the time). My old trusted iPhone 4S finally gave up the ghost last week so I upgraded to an iPhone SE which proved a real upgrade. (I was too lazy to bring out the Canon G16 in the underwaterhousing, which would not have been much use anyway as the pools here are very shallow.) The pools were teeming with (mating) polychaete worms and there were many juvenile Sea hares about as well. I saw whole mats of pink wriggling tentacles sticking out of the sand, something I had never seen before. These (most likely) belong to the worm Cirriformia tentaculata, quickly identified by David Fenwick, see here for very good photos of the whole animal on his aphotomarine site in addition to the rather bad snap here. I found a hermit crab inhabiting the shell of a (juvenile) pelican’s foot Aporrhais pespelecani, a species that shares the sandy beach with the razor clams that were washed up all around. The highlight for me were the anemones. Snakelocks and strawberries were common, and in addition to red Beadlet anemones, there were green ones as well (I never see these in Falmouth). Some pools at the edge of the rocks and the beach were filled with Daisy-, Gem- and Dahlia anemones. I am ready for some more seaside adventures, but the weather is rarely cooperating these days. More on the blog soon I hope! I have not posted as much on the blog as I would have liked this year (in fact, I keep posting less and less: 24 times this year, compared with 33, 46 and 64 posts the previous years). My new year’s resolutions will be to dive more, to go rock pooling more and to blog more. For now, I will post some miscellaneous photos from this year that I did not bother to put on the blog at the time (as I did last year). Below a Beadlet anemone Actinia equina on the beach in St. Ives as well as a young cormorant looking for food taken with my new Canon G16: I caught a number of different fish this year, the first photo shows a small Montagu’s blenny Coryphoblennius galerita in an aquarium net which were fun to watch in a little aquarium. Next a Longspined scorpionfish Taurulus bubalis caught with my big net off the quay and a Sand smelt Atherina presbyter (see here for a movie). The latter species did not last long in my tank unfortunately. I mentioned in the last aquarium update that a Topknot I caught seemed to have died in the tank too, but I found out it is still there, it just likes to hide behind the rocks. I visited the quirky Victorian Horniman Museum and Aquarium on a trip to London which features lots of stuffed animals and diorama’s which I find quite fascinating. The aquarium part is small; there is some behind the scene coral (sexual) propagation research going on which sounds very interesting. There were two or three coldwater tanks too, the larger tanks were not much too look at (I know how hard it is…) but I really liked the Victorian fountain-style aquarium. A quick snap here; see this video for a nice overview. I would like to collect some Black brittlestars Ophiocomina nigra next year, they can be very abundant at slightly deeper sites. I also visited the National Marine Aquarium in Plymouth for a second time. It features the deepest aquarium in the UK, complete with plane wreck and some Sandtiger sharks. I was more interested in the coldwater stuff, of which there was quite a bit. I especially liked the Lesser weever Echiichthys vipera which can be caught on sandy shores; their venomous sting would make handling a bit tricky though. There were some cute pipefish (these need live food and I do not want to commit to that) and a round display with loads of Snakelocks anemones (see the first picture posted on this blog). I have placed a couple of these in my aquarium again, perhaps I need to get a few more, as they are so pretty and easy to keep. I did not manage to get a good shot of the very impressive Wreck fish or Stone bass Polyprion americanus in the large coldwater display unfortunately. Next up a washed up sponge in Falmouth (species unknown) and a live one (Aplysilla sulfurea) under a rock, both taken in Falmouth with my iPhone. I have only been diving a couple of times this year and did not post about the rocky shore dives (here some photos of the maerl and eelgrass beds). I have seen a variety of interesting animals, including cuttlefish, a conger eel and lobsters but next year I hope to go out a bit further and dive a bit deeper to finally see jewel anemones and dead man’s fingers. I am not sure I want to commit to a flash and strobes though, instead I’d like to practice my rock pool (seaweed) photography. Last month we had a great holiday travelling from San Francisco to Seattle. Nature here is awe-inspiring for the average European; we saw snowcapped volcanoes, giant redwoods, dunes, beaches, mighty rivers and temperate rainforest. This is not the place for a travelogue, however, rock pools were of course checked and that is prime blog material! We had a bit of a happy-go-lucky approach to travelling and I had not checked tide times beforehand. Turns out that the tides on the Pacific West coast work very differently than those in Western Europe: instead of two almost equally low tides a day, there is a proper low tide and a not so low tide, how inconvenient! (This page has a good overview of tide types, including another type with only one low- and one high tide a day.) In the end I had two early mornings on the Oregon coast for rock pooling: Bob’s Creek Wayside south of Yachats (pic above) and Seal Rock north of Waldport (see map). (I actually prefer the more appropiate American term ‘tide pooling’ as of course there are also (freshwater) rock pools that do not experience tides.) The coast in most of Europe is so much more densely populated it is almost strange to see that vast stretches of pristine coastline with hardly any people around, brilliant. Also, the vast amounts of driftwood and logs is almost unseen in Europe, as thewhole continent is pretty much deforested (especially in the UK, my guess is only places like Norway could be comparable in that respect). Being at the Pacific Northwest tide pools made me feel like a kid in a sweetshop: I could not decide to stick with a beautiful find or try to move on to the next exciting thing. It seemed a bit useless to just start documenting all the different species in the short amount of time I had. Instead I mainly enjoyed just looking around, especially admiring the Green surf anemones Anthopleura xanthogrammica (above). I know this species mainly from the Coldwater Marine Aquarium Owner group on facebook which has many North American members. Although the diversity of animals and seaweeds in the South West of the UK is amazing, I must admit I am always a bit jealous of the critters in Pacific Northwest tanks! The Green surf anemones are not only strikingly coloured and large, but also incredibly common, along with the Aggregating anemone Anthopleura elegantissima forming dense carpets on the rocks, inhabiting gulleys low on the shore to tide pools quite high on the shore. I had taken the plunge and ordered a new camera for this holiday, a Canon G16 with a Fantasea underwater housing (see this post). However, I did feel comfortable with it in its bulky housing yet and so reverted to the more basic Canon powershot D30 and my iPhone for these sessions instead. I saw a couple of the large nudibranchs Hermissenda crassicornis as well as a Janolus fuscus, very pretty. Also below a Lined (or striped) shore crab Pachygrapsus crassipes and an unidentified prawn. Otherwise, most of the photo’s turned out to be not that great; I was just too hasty! Although all species were different (except for the Plumose anemones Metridium senile I saw on some pontoons), it was interesting to see the parallels with Cornish rock pools. For instance, all seaweed colours, shapes and textures I knew from home were present here, just in different combinations in each species. There were noticeable differences too. For one, many of the American organisms (chitons, isopods, anemones) are much bigger. The rocks were almost completely covered in barnacles and mussels (again both huge). Seagrass (Phyllospadix) was growing from the rocks! Two mornings of rock pooling in a three week holiday was not enough, but all that was manageable unfortunately. We however also visited the Oregon Coast Aquarium in Newport on the single rainy day we had and that was pretty good. I am not a big fan of the generic aquarium displays (sharktunnels, ‘nemo’s’, scary Moray eels etc) so it was nice to see mainly coldwater aquaria, especially the nanoaquariums that housed a jumble of sponges, anemones, barnacles, chitons and strange fish, such as one of my favourites, the Grunt sculpin Rhamphocottus richardsonii which camouflages as a giant barnacle (first photo, see also here). A touch pool contained sea cucumbers, huge abalones and the largest chiton species in the world, the Giant Pacific (or Gumboot) chiton Cryptochiton stelleri, humongous! I hope one day to be back in this beautiful part of the world. Yesterday during a quick lunch time ramble on Castle Beach I found my first Topknot Zeugopterus punctatus. Unlike most flatfishes, this species inhabits rocky areas. Had I brought a bucket, I would have definitely taken it home for the aquarium, a very pretty fish! A nice low tide at Falmouth’s Castle Beach today. The weather was not great but at least it was not raining (I still managed to get quite soaked, including my wallet…). Quite a lot of brittlestars, urchins, worm pipefish and porcelain crabs around. I did some collecting for the aquarium: beadlet and strawberry anemones, snails and urchins. Otherwise I focused on the smaller stuff and took pictures with the olloclip macrolens on my iPhone. First two tiny crustaceans that I have not attempted to identify and what I think is a tiny Edible crab Cancer pagurus. The nicest find was a white colonial tunicate that at very first sight looked like an eggmass. I could not readily identify it using the usual websites, so hope that the NE Atlantic Tunicates facebook page members can help me out (Note: they did, it could be a ‘regressed’ Diplosoma spongiforme). On Sunday I had a quick look in Flushing and for the first time found some juvenile Candy-striped flatworms Prostheceraeus vittatus (see here for adults), very pretty! When going out rock pooling, I always take my iPhone and Canon Powershot (for underwater use) and take at least a couple of photos. Because of a lack of time, or because a single good photo is not enough for a new post, not everything ends up on the blog. Now I have some free time, I picked a couple of unused photos made this year that seem blog-worthy. First up, In realized only what I had found on the beach at St. Ives when leafing through the The Essential Guide to Beachcombing and the Strandline: a Seabeard! This hydroid, Nemertesia antennina, grows as stiff colonies protruding from a matted base and occasionally washes up on shore. It looks a bit plant-like; at the time I did not have the opportunity to have a closer look and just snapped a quick photo. Next a Lesser sandeel Ammodytes tobianus found at Gylly beach. I always see them when snorkeling or diving (see here) but this was a good opportunity to see one up close (I get excited when I spot a dead fish on the beach (see also here) and I am not afraid to admit it!). Following are two colour varieties of the Spiny starfish Marthasterias glacialis, a Common brittlestar Ophiothrix fragilis and a shot of an Aequorea forskalea (or maybe A. vitrina) jellyfish. Next the gastropod mollusc Chinaman’s hat Calyptraea chinensis. I went back to Mylor marina for some pontooning recently but not much was growing; the only thing that stood out was the luxuriant sponge growth (I am not sure of the species, perhaps Halichondria). 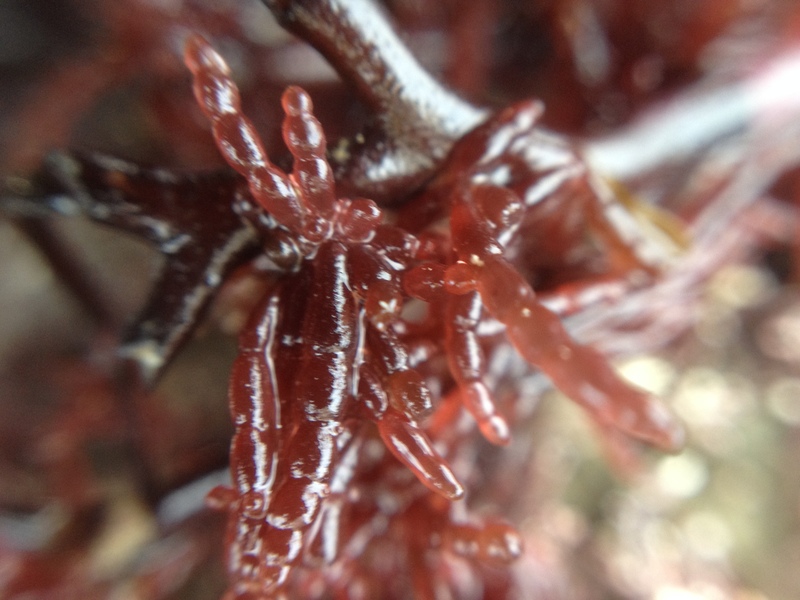 And of course some seaweed pictures. By iPhone: Under tongue weed Hypoglossum hypoglossoides in Flushing, Black scour weed Ahnfeltia plicata in St. Agnes and a photo showing a variety of wracks all colonizing the same patch (Flushing): Serrated wrack Fucus serratus, Spiraled wrack Fucus spiralis, Bladderwrack Fucus vesiculosis and Egg wrack Ascophylum nodosum. Next some Canon Powershot underwater pics (see also this post and this one): a random rock pool picture of mostly decaying seaweed, a closeup of my favourite the Bushy rainbow wrack Cystoseira tamariscifolia and a shot of Wireweed Sargassum muticum that has completely taken over a pool. Finally an SLR photo of a rock pool at Gylly beach with large Cystoseira baccata plants (middle, Wireweed on the left). It was a very nice day this Saturday, and the plan was to collect more seaweed species for a student project that I am supervising (see for an introduction my work blog here and for project updates student Abi’s blog). 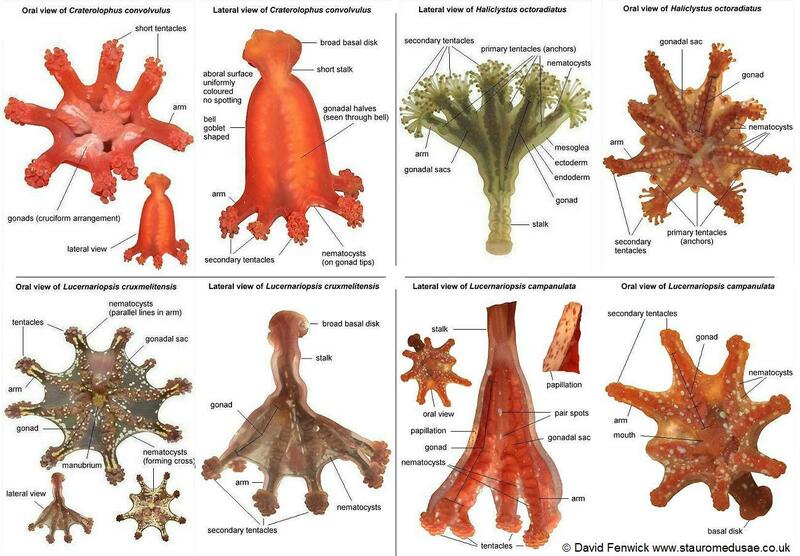 We were very lucky to have David Fenwick Snr and his partner Carol of aphotomarine fame to help us to find and identify species (you might also know him through a variety of UK marine facebook groups). We took to the rocks beneath the Jubilee Pool in Penzance (the end of the Cornish main train line and both the most Southern en the most Western station in England). As the focus was to get new species for Abi’s project, I did not focus on photography or finding other species so I have only a few pictures to show. One exception of course was that we had to see some stalked jellyfish; this is one of the specialties of David and he has dedicated an entire website to these beautiful creatures: stauromedusaeUK. These little animals are related to jellyfish but are attached on rocks and seaweeds on the shore. Ten species have been recorded in the UK. 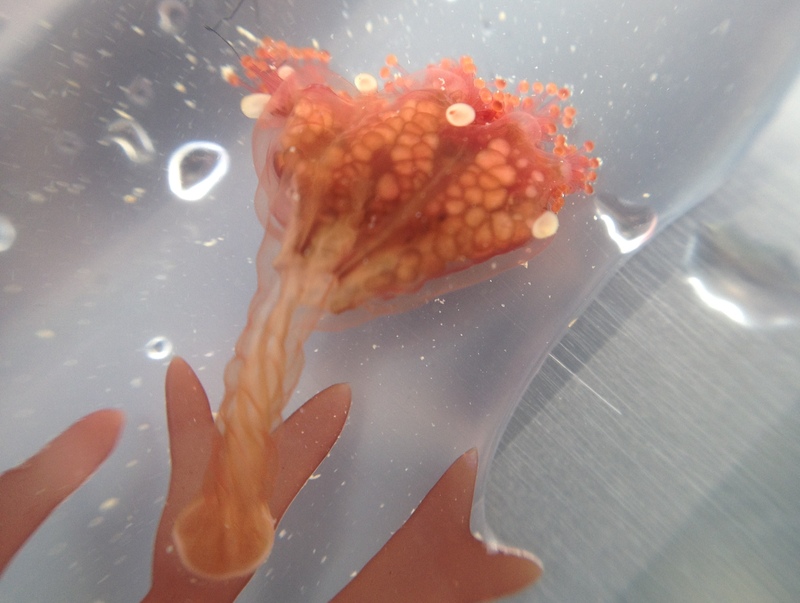 One of the more common ones is the Spotted kaleidoscope jellyfish Haliclystus octoradiatus; although a crappy iPhone photo, the stalk, arms with secondary tentacles at the end, white nematocyst spots and gonadal sacs are clearly visible: On to the seaweeds: about 15 new samples were collected. A species we did not take was Creephorn Chondracanthus acicularis, which according to Davis memory was last recorded in Penzance in the 1880s (first pic). We did collect a good amount of the epiphyte Champia parvula (second pic). Unfortunately no time to pick up some Wakame from nearby Newlyn marina or go to a spot with some good Prasiola growth but all in all a very successful and enjoyable trip! When publishing the last post, I noticed that the next one would be the 100th; I have been quite the blogger the last year-and-a-half! Although this is a pretty obscure blog, it is still fun to see that people from all over the world (Bosnia, Jemen, Maldives, Cape Verde) check it out. It takes a bit of time writing posts, but it has been a good way to take stock of what I have seen and learned, much better than just having a folder with pictures on my computer. It has even brought me in touch with some fellow enthusiasts. 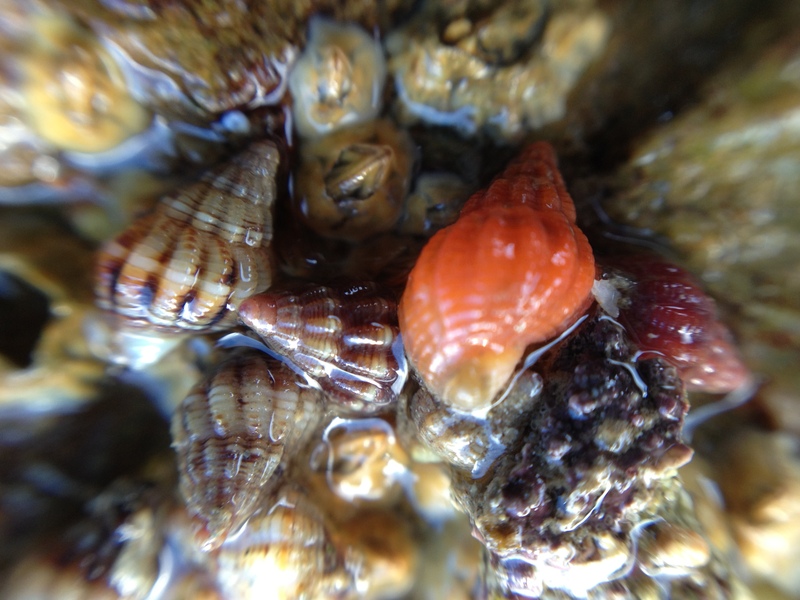 For this post I made a Picasa album of a bunch of rock pooling macro pictures I took with my iPhone 4S + olloclip lens (not the cheapest macrolens for the phone but it is worth every penny). The majority of them have been featured on the blog at some point. The two pictures below haven’t: a Black shields lichen Tephromela atra and some Thick-lipped dogwhelks Nassarius incrassatus. The complete album can be found HERE.